Thousands attend Freedom Park Crusade, Guntur, A.P. “Now there is at Jerusalem by the sheep market a pool, which is called in the Hebrew tongue Bethesda, having five porches. In these lay a great multitude of impotent folk, of blind, halt, withered, waiting for moving of the water. We learn the great desire of our Heavenly Father to alleviate sickness and disease by sending an angel to trouble the waters to bring healing. It was a foretaste of His Son's miracle ministry to heal everyone who came to Him for His healing touch. It was also a picture of the Church healing the sick and suffering and pointing to freedom from sickness and death in the Millennial Reign of Christ. What strikes me so profoundly when studying this portion of God's Word is the great needs of the sinful, sick and suffering all around us, and their intense desire to be healed. Secondly, a supernatural move of God is necessary to get people's attention to “wait for the moving of the waters.” When authentic miracles begin happening in a Church or through a preacher's ministry, people will begin to congregate in that place. Wherever Jesus went He healed the sick and performed miracles and multitudes attended His meetings. The Bible records: “And a great multitude followed Him because they saw His MIRACLES which He did on them that were diseased.” (John 6: 2); “And Jesus went about all Galilee, teaching in their synagogues, and preaching the Gospel of the Kingdom, and healing all manner of sickness and all manner of disease among the people. The same was true in the lives and ministries of the Early Church: “Now Peter and John went up together into the temple at the hour of prayer, being the ninth hour. And a certain lame man from his mother's womb was carried whom they laid daily at the gate of the temple which is called Beautiful to ask alms of them that entered into the temple; who seeing Peter and John about to go into the temple asked an alms. And Peter fastening his eyes on upon him with John said unto them, Look on us. And he gave heed unto them, expecting to receive something from them. “Then Peter said: “Silver and gold have I none; but such as I have, give I unto thee; In the Name of Jesus Christ of Nazareth rise up and walk. And he took him by the right hand, and lifted him up: and immediately his feet ankle bones received strength. And he leaping up stood, and walked, and entered with them into the temple, walking, and leaping, and praising God. And all the people saw him walking and praising God. What was the outcome of that great miracle which God performed as Peter and John exercised faith in the Name of Jesus Christ to raise up that impotent man! Here it is: Howbeit many of them which heard the Word believed, and the number of the men was about 5,000. Hallelujah and Amen. ST. PAUL SAW GOD'S MIRACLES & REVIVAL! “For I will not dare to speak of any of those things which Christ hath not wrought by me, to make the Gentiles obedient by word and deed, through mighty Signs and Wonders, by the power of the Spirit of God; so that from Jerusalem, and round about unto Illyricum, I have fully preached the Gospel of Christ. “Yea, so have I strived to preach the Gospel, not where Christ was named, lest I should build upon an other man's foundation.” (Rom. 15:18-20). What a statement from a former persecutor of believers in Christ! Here was a man who met Jesus Christ the Crucified, Resurrected and Glorified Son of God on the Damascus Road and who died as a MARTYR after founding Christ's Church in the Gentile world! JESUS USED HIS HUMBLE SERVANT! By God's great grace, I have seen this phenomenon in my own Ministry around the world for more than fifty years. When Jesus performed staggering miracles in the Manila, Philppines Crusade in 1966, word spread and about 1,100 souls joined Bethel Temple (now Cathedral of Praise). When Sal Marisigan's leg - stunted by polio - grew out more that 12 inches, it caused 100 members of his extended family to come to Christ and join the Church. 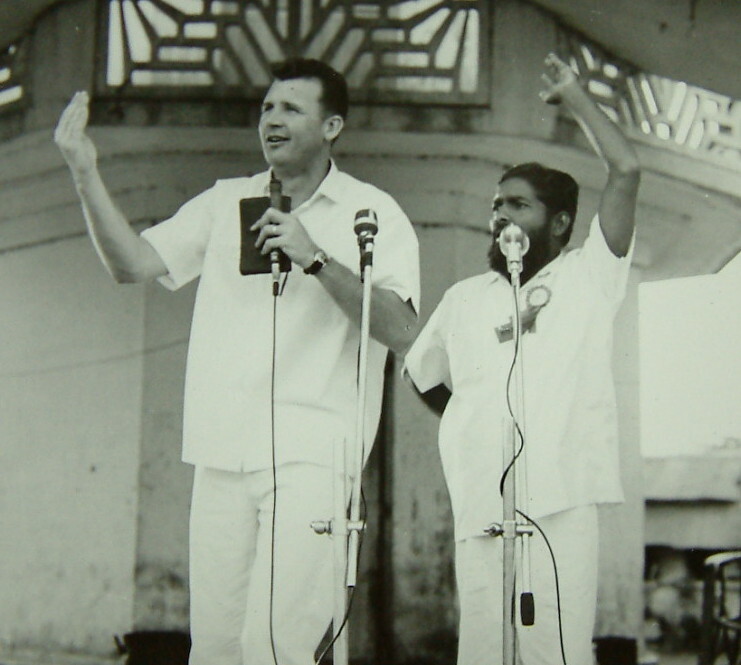 During our 1966 Gospel Crusade in the Freedom Park in Guntur, A.P. 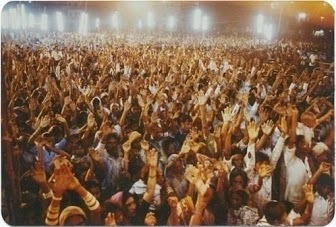 India, when Jesus Christ liberated a demon possessed woman in an awesome display of Holy Ghost power as I cast out the demons in His holy name, the crowds surged from 2,000 upwards to ca 15,000. And Dr. Serala Elisha the Head medical physician of the Kugler Lutheran Hospital publicly confirmed that a 13 year-old-boy who earlier had an eye removed by surgery, three days after prayer in Jesus' Name a new eye appeared in that empty eye socket and continued growing to normal size with perfect vision! The crowds continued to grow! The Inspector General had suffered a stroke and was paralyzed on the right side. He could speak only with much difficulty, as the right side of his face was drooping. His right arm was drawn up in a ball on his chest. The six Circle inspectors stood at attention in his room. His wife and another lady were present, as well as my associate Thomas Tutyko. I said, “Since you want me to heal you in the Name of the Lord Jesus, I must tell you why His name is so powerful.” He nodded that he understood. For about fifteen minutes I expounded unto him the Holy Scriptures about Jesus Christ. I asked him to follow me in the prayer of repentance and confession of faith for salvation. He struggled but slowly got the words out. He threw back the blanket and I took his hands and helped him out of bed. He and I began marching back and forth. Then, he shook his hand free from me and marched back and forth perfectly normal. GUNTUR CITY COUNCIL INVITES US BACK ! What was the outcome of that miracle? Any policeman who had sick family members got the day off so they could bring them to me for prayer, And that is what I did throughout the afternoon. The Guntur City Council begged us to stay another five days, but the weather was so hot (140 F and 100 F at night with no air conditioning) that we deferred. The Crusade in Guntur was so successful that the City officials formally invited us back to their city in December of that same year. Both Prime Minister Lester Pearson and the Right Honourable John Diefenbaker wrote me letters congratulating us for our successful time in India. During the December 1966 crusade in Guntur, AP India, we attended the Annual Police Sport's Day. They announced that the one mile race was open to anyone. 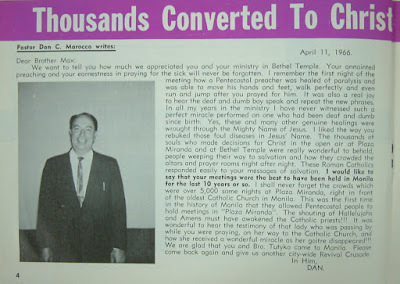 Since I had won the Half-Mile for Saskatchewan in 1951, Bob Hoover, Thomas Tutyko and Missionary Lawson Barbour felt that I should compete to get exposure for the CRUSADE. I was number three when we came around the track at the half way mark, when I decided to graciously pull out of the race. We got the publicity for JESUS and they were thrilled that I had participated. All glory to God! WHAT CAN WE EXPECT IN THE FUTURE! Here are some very important questions: “Are the promises of God for only a limited duration or are they eternal? Does God change His eternal purpose and plan to conform to the whims and fancies of a jaded and perverted society who feel strongly that their opinions are on par with or greater than God's Word, the Holy Bible? And how much longer will the mercy and grace of God be extended to a lost humanity which has locked the Creator and Life - Giver out of their lives? Is there hope that righteousness will rule over unrighteousness and that the will of God will also become the will of His creation? And, how can sinful man approach a thrice Holy God, which demands repentance, faith and worship? Finally, how does Jesus of Nazareth fit into the Salvation Plan of Almighty God, the Ancient of Days? St. Paul introduces the Saviour, Jesus Christ our Lord, Who paid the price for our emancipation from death to life, through His incarnation and vicarious death for us on the cursed tree, where He became a curse for us to meet the righteous demands of Divine Justice for our sins! He became the propitiation for our sins and for the sins of the entire world. JESUS' VICARIOUS DEATH SATISFIED GOD! The Bible states: “In this was manifested the love of God toward us, because that God sent His only begotten Son into the world that we might live through Him. Herein is live, not that we loved God, but that He loved us, and sent His son to be the propitiation for our sins.” (1 John 4: 9, 10). The word propitiation means satisfaction, mercy seat, expiation. The sacrificial, vicarious death of Jesus of Nazareth satisfied the demands of divine justice in the courts of Heaven to atone for the sins of Adam and Eve and their sinning progenitors, for all time. John the Beloved wrote: “My little children, these things write I unto you, that you sin not. And if any man sin, we have an advocate with the Father, Jesus Christ the Righteous: And He is the propitiation for our sins: and not for ours only, but for the sins of the whole world.” (1 John 2: 1,2). WILLIAM COWPER tried several times to commit suicide. He tried to drink a glass of hemlock but his hand trembled and he dropped the glass. He put a gun to his head but was unable to pull the trigger. He ran onto the bridge overlooking the Thames River in London to jump to his death, but “a strange power restrained me”, he said. He tried to hang himself, but someone rescued him. Finally, he was taken to St. Alban's Asylum. According to Gilbert Thomas: “William Cowper was melancholy and introspective believing he was beyond hope, believing Christianity was true, but was not capable by faith to believe for himself. He felt rejected. Then, one afternoon in the Garden of St. Alban's Asylum he picked up the Bible and read Romans 3: 25. Till all the ransomed church of God. Are safe, to sin no more. Until Jesus Comes to receive us into His Heavenly Kingdom. Amen.